IF YOU RELOAD AND SHOOT FOR ACCURACY, WHY NOT MEASURE YOUR GROUPS THE WAY THEY ARE MEASURED AT BENCHREST MATCHES, WHERE THE DIFFERENCE BETWEEN WINNING AND LOOSING IS OFTEN NO MORE THAN A FEW THOUSANDTHS OF AN INCH. 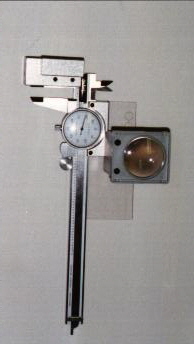 THE MEASURING TOOL CONSISTS OF A HOLDING DEVICE ATTACHED TO THE FIXED JAW OF THE CALIPER, AND A PLEXIGLASS PLATE WITH SCRIBED CENTERLINE AND RETICLES FOR VARIOUS CALIBERS IS ATTACHED TO YOUR DIAL OR DIGITAL CALIPERS. THE USE OF THE CUSTOM PRODUCTS TARGET MEASURE TOOL WILL SPEED UP THE MEASURING PROCESS AND BE MORE ACCURATE THAN THE OTHER METHODS.